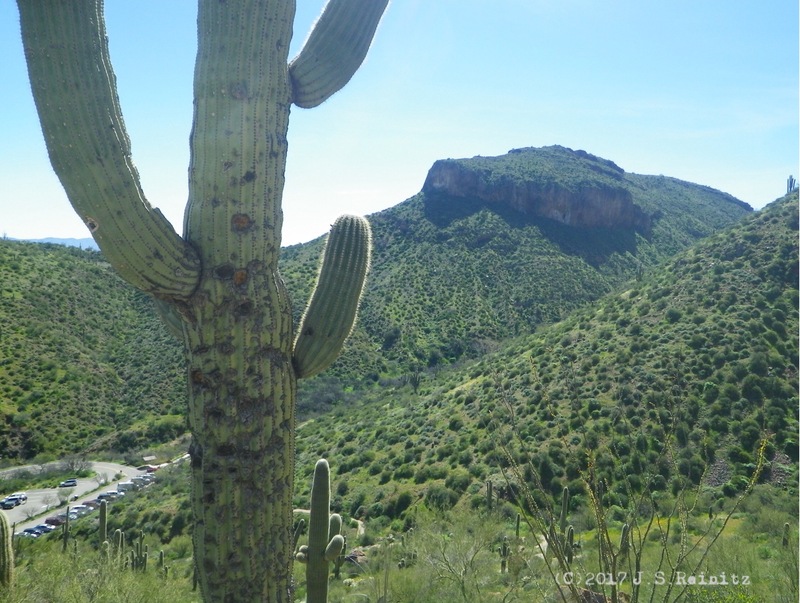 From the Phoenix-Mesa area, there are two ways to reach the secluded cliff dwellings that are the Tonto National Monument. 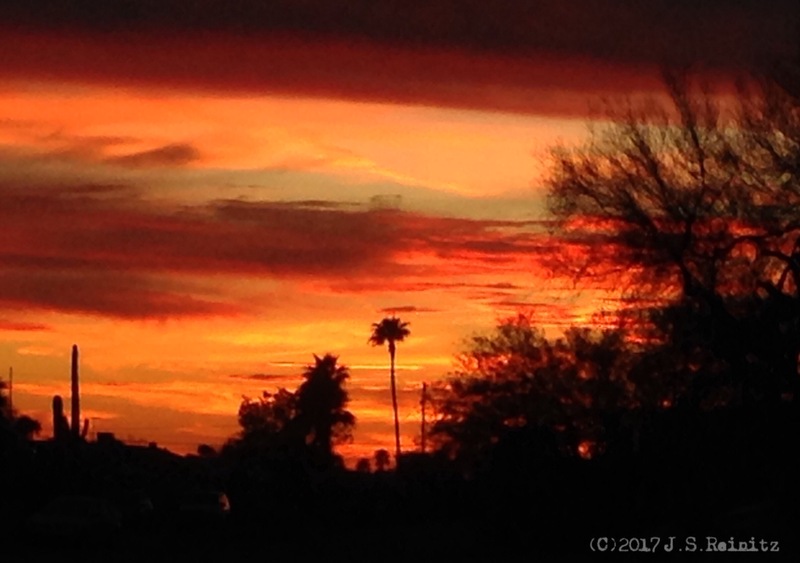 There is the counterclockwise route, cutting south of the Superstition Mountains on Highway 60, an easy going, paved road that passes through Miami, darts west just before the mining town of Globe on Highway 188 and reaches the caves in 78 miles. 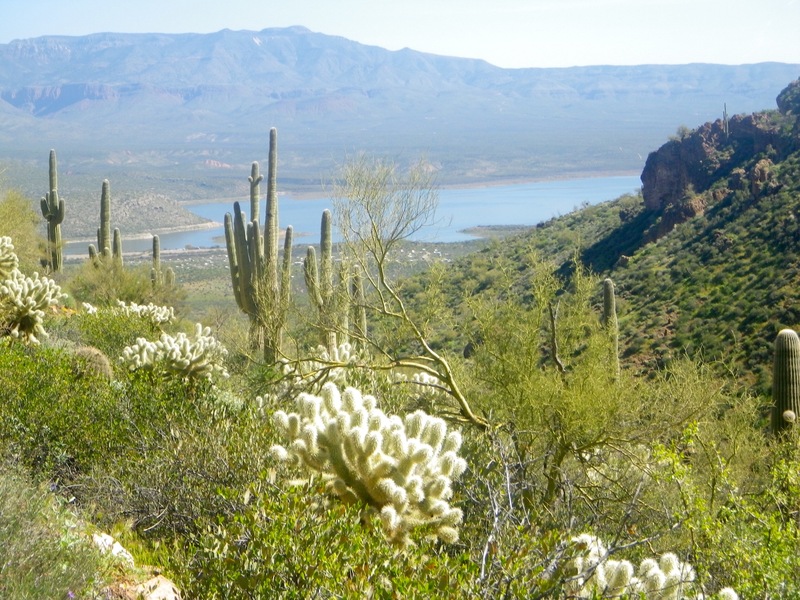 But getting a real feel for the land means taking the northern route on Highway 88, known as the Apache Trail. While the 40-mile trail is shorter, the going is slower, and you might as well a century away. Just past the tourist stop of Torrilla Flat, the pavement gives way to parched dirt road that winds along the cliffs and gullies carved by the Salt River and its tributaries over eons. The sometimes single-lane path is known for narrowing at curves, creating a bottleneck between a cactus-infested cliff wall for traffic on one side and thereat of a tragic plunge for traffic on the other. Some recreational vehicle rental companies prohibit their customers from exploring this road in their behemoths. Don’t get me wrong. There are some level, low-altitude straightaways with no danger of rolling down a rocky cliff. These portions are usually marked with flash flood warning signs. The trail had been a Native American path and old stagecoach route that was shored up in the early 1900s to transport supplies to dam projects along the Salt, according to relatives, Wiki and local tourism websites. 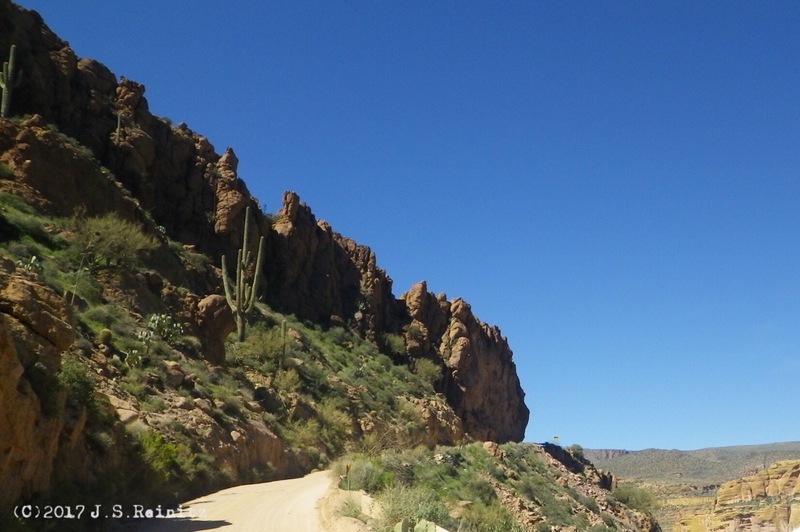 We opted to take the Apache Trail on our return trip from the cliff ruins partly because I wanted to stop at Tortilla Flat, but mostly because I had forgotten how slow and arduous the journey is — especially on the return route. Driving to the Tonto National Monument on the Apache Trail you get the wall side of the road, driving back you get the plummet side. Sure, the view was spectacular. At least that’s what my passengers told me. The sights shouldn’t be enjoyed by the person behind the steering wheel, at least not for very long. We did meet an oncoming, full-size, pull-behind travel trailer dragged by a heavy duty pickup that had a gigantic stainless steel gas grill in the backbox. We pulled over, inching toward the ledge so he could have enough room to pass.